Having lived in the border town of Point Roberts, Wa for six years prior to launching our magazines, Bellingham was our second home. It still is a favorite place to visit, as the lure of Bellis Fair Mall, Mount Baker and the Dutch Village at Lynden continue to attract the ladies of our family. As a personal choice, I get a kick out of visiting Old Fairhaven, site of the Alaska Marine Highway Terminal, the Colophon bookstore, and many quaint, turn of the century buildings. I even found a museum of old radios, that date back to the crystal set and Marconi's era. Western Washington University campus is just up the drive on Sehome Hill, where one can look clear across the Bellingham Bay to the San Juan Islands. Alpha Aviation no longer exists at all. Bellingham Fuel Service (360 671 1600) has replaced them with Texaco products, Jet A and 100LL. Bakerview Aircraft Maintenance no longer exists. Whatcom Territory Aero Services has replaced them for aircraft maintenance services. A new Bellingham based Airline Bellingham Air Service (360 671 2250) is offering charter services to the San Juan Islands and the Puget sound area. John Sibold has moved on to the Washington State Dept. of Transportation, Aviation Division. He has been replaced by Art Choat. ARight: Scenic excursion trains once connected the cities along the Pacific Coast, including Vancouver via Seattle and Bellingham. Now at last the train is back and it's doing well according to Amtrak. Bellingham is also southern terminus of the Alaska Marine Highway fleet, and has a modern airport near the Bellis Fair Shopping Mall. See item below. One Fairhaven experience I'll never forget, is staying at a unique bed and breakfast that's perched halfway up the hill, looking like something from an Alfred Hitchcock movie set. Adorning its ancient porch railings are several hand carvings of black cats. According to the story, the original owner's furry felines populated most of Fairhaven and Bellingham in the late 1800s and were banished like Napoleon to an island, which failed to hold them all, and many escaped back across the bay. Despite the guest home's menacing look, we had a wonderful experience and a typical Washington breakfast. Speaking of food fit for royal palates, try the Oyster Shack on the scenic Chuckanut Drive that winds south along the shore from Fairhaven. Bellingham International Airport is a 24-hour, full service commercial airport located just minutes south of the U.S. - Canada border in northwest Washington state. Bellingham International is a growing airport which sees some 250,000 people traveling through it each year. 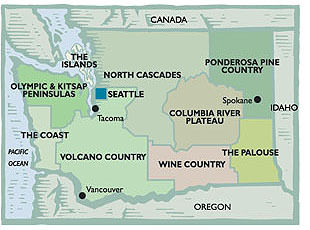 Connecting flights, on such commuter airlines as Horizon Air and United Express, transport air travelers to Seattle and locations beyond. Bellingham International Airport offers various ground transportation services for travel to and from the Airport. A 500-space parking lot adjoins the Main Terminal, with parking at $.80 / hour $4.80 / day $28.75 / week. For further information call (360) 733-5823. Quick as Air Coastlines - Canada Reservations: (604) 244-3744 / U.S.
A pre-order duty-free luxury goods and deluxe confectionery shop The airport's new Aviation Center was completed in August, 1998. For visitors who are driving, Bellingham (population over 61,000) is 90 miles north of Seattle and an hour south of Vancouver. It faces the Pacific on Squalicum Harbor, Bellingham Bay, second largest port in Puget Sound. Being an active waterfront port, you'll see evidence of fishing, cold storage, boat building, shipping, paper processing and marina operations. We're told that almost 2,000 pleasure and commercial boats are moored at the port. From here tourists can book cruises to Vancouver Island and the San Juan Islands. Downtown Bellingham has retained much of its mid century charm, with a selection of restaurants, specialty and art shops, plus the Whatcom Museum of History and Art (built in 1892) and an excellent library which we frequent whenever the opportunity arises.